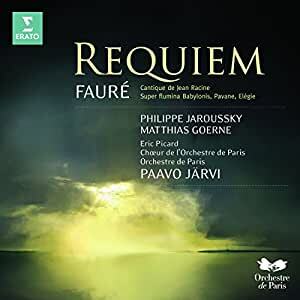 The second Virgin Classics CD from the Orchestre de Paris under its new Music Director, Paavo Järvi, is entirely devoted to Fauré, with his Requiem as the centrepiece. The soloists are baritone Matthias Goerne and, singing the Pie Jesu usually assigned to a soprano, countertenor Philippe Jaroussky. Paavo Järvi assumed his role as Music Director of the Orchestre de Paris at the beginning of the 2010-11 season and this, his second Virgin Classics recording with the orchestra, is based on concerts that took place in Paris in early 2011. Like its predecessor, a programme of Bizet released in Autumn 2010 (admired by the UK's Observer for the "perfect athleticism and agility ... provided in abundance by the Orchestre de Paris under its new conductor, Paavo Järvi), it is entirely devoted to music by one French composer -- here Gabriel Fauré. His serene, consoling Requiem is the main work on the CD, which also includes three other much-loved pieces and one little-known item. The Requiem features two vocal soloists, usually a soprano and a baritone. Here, however, a countertenor - exclusive Virgin Classics artist Philippe Jaroussky - brings his ethereal timbre and sensitive phrasing to the poised Pie Jesu. His baritone colleague is the warm-toned German Matthias Goerne, acknowledged as on of today's finest vocal recitalists. The Chaeur de l'Orchestre de Paris also perform in three other works on the CD, the exquisite Pavane, with its flowing melody and mock-Rococo verses, and two early works to religious texts, the touching Cantique de Jean Racine and Super Flumina Babylonis (By the Rivers of Babylon). The Fauré Requiem is a work that has withstood variety of interpretation in the several guises in which it has been rendered. It almost always emerges unscathed, and one always seems to find a good reason why any given interpretation gives much pleasure. It is the genius of Fauré that created a work of such beauty which hides its knowing sophistication under a humble cloak of utter simplicity. Paavo Järvi's interpretation is quite remarkable, and for me, ranks among the best combining deep feeling, sumptuous execution with adequate degree of elegant reserve. Textual issues: some years ago, John Rutter unearthed and recorded a temporary version Faure devised for its initial performance at La Madeleine in which accompaniment was minimized by using only violas, cellos, basses, a solo violin in the Sanctus, harp, tympani, and organ/harmonium. It is a lovely version which gained some popularity after Rutter recorded it, but it was a version never intended by Fauré to be anything other than a stop-gap measure: he had a committment but ran out of time. Thus this so-called "chamber" version, never intended by the composer to be his final word. Fauré always intended a full orchestral complement which he finally completed years later, probably with assistance from students, but under his strict supervision; he fully approved of the score as subsequently published. If legitimacy is an issue, the fully orchestrated version is the true one; all the others are exercises, albeit of good merit, along the way. The fully orchestrated final published version is what Paavo Järvi provides us with here, and he excels. Indeed the whole recording is a sumptuous affair, bringing out luxurious sounds from soloists, chorus and orchestra. No, this is not bloated: there is clarity to the musical lines, subtlety in the phrasing and a remarkable dynamic range. Matthias Goerne excels in his solos. The soft-grain inherent in his voice provides this music with the reverence it requires; the unison passages in the Libera Me thus emerge as indeed a humble plea rather than a baritone showing-off his golden tones (which Goerne has to spare). His experience with lieder shows in his respect for this music and its text. A special treat is Philippe Jaroussky assuming the treble part. This is a unique experience. He is one of the top counter-tenors in the world today, indeed one could say that together with Max Emanuel Cencic, there are none better. His soprano voice brings a spiritual intensity to the Pie Jesu which blends the ascetic quality of a boy treble with the solid support of a fully developed adult singer. It is a marvelous experience. All told this is superb rendition of the Fauré Requiem to which I will return a few times in the future. The companion pieces, all by Fauré, are also very well executed. Of special interest is the previously unrecorded, youthful Super Flumina Babylonis. The Pavane is given its choral component and one realizes how much one misses when, as usual, one does not get it. The Elégie is suitably intense. And the beloved Cantique de Jean Racine has never sounded more mellifluous than here, perhaps its only rival being the Orfeon Donostiarra with Michel Plasson and the Toulouse orchestra. In short, this is a cd to treasure and which through the years will yield many satisfactory hearings. On the technical side, Virgin's recording is flawless. 5つ星のうち4.0Splendid Faure Requiem & Excellent Program Including The Rarely Heard "Choral" Pavane and "By the Rivers of Babylon" Cantata. This "live" recording from Paris' Salle Pleyel boasts one of the finest Faure programs on CD including, as it does, a rare performance of "On the Shores of Babylon" as well as the popular Pavane, but with the rarely heard optional chorus. The sound quality is attractive concert hall sound, rather direct but warm. Many listeners will prefer a more resonant acoustic for the Requiem performance which is easy enough to find elsewhere, but I recommend getting this for the accompanying pieces, particularly the "Babylon" cantata and choral Pavane. The Cantique is very nicely sung and inclusion of the Elegie for cello and orchestra makes for a generous program on a single disc. The orchestra is in splendid form as is the chorus. So nice to hear a taut french ensemble with their particular vowel sounds in the latin and of course, fluent french in the accompanying pieces. Jarvi's approach in the Requiem is rather slow throughout but there is never any lack of tension and a nice swelling in climaxes. My only complaint, and the reason for 4 stars, is the unfortunate choice of a counter tenor in the "Pie Jesu". I much prefer a light lyric soprano. 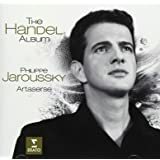 Jaroussky is a marvelous musician but the combination of his pure white sound in attacks followed by a rather strange vibrato on releasing notes makes me long for a soprano in this rep. I can better tolerate a male treble as in the famous Willcox King's College Choir recording on EMI but even that has its fair share of critics. In the Requiem, I prefer either the Telarc Shaw/Atlanta Sym & Chorus recording with Judith Blegen and James Morris or the classic Cluytens/Conservatoire on EMI with the incomparable de Los Angeles and Fischer-Dieskau. Still, this is a lovely performance of the Requiem accompanied by some very generous and unusual filler pieces. You haven't heard the "Pavane" until you hear this recording with the optional chorus. It really fills out the piece beautifully. This is a completely competent performance of Faure's Requiem, but definitely not my favorite. For me, it's just all over and done with entirely too quickly. Not that it's too fast, mind you, just that this transcendent score isn't given terribly transparent treatment. I'm not frequently in the mood to hear this piece, and when I am, I want to hear its blood and guts. Because it's definitely there, somewhere, you just have to know how to find it. Both as a conductor, and as a listener. But perhaps the fault was somehow in the engineering room. I'm just not getting a lot of dynamics, not even Matthias Goerne (who does an incredible job, and has the most wonderful voice in the entire world, perhaps ever -- in my opinion) came across as himself due to the recording. There is no point in the entire performance where I cried. And I really wanted to, I'll admit. Why to buy the disc? As a curiosity, I suppose. Although I bought it for Matthias Goerne, and that's the section it will get filed under in my library, it's really for the curiosities of hearing Philippe Jaroussky sing a part not traditionally heard from countertenors -- and also for the other, lesser known music available on the disc, which is a nice bonus.